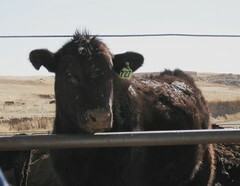 This is one of Jim and Bob's cows. Looking at this picture now, I'm going to call this one "Secret Agent 727" -- it has a number for a name. Actually, it was time to take the cattle to market, so they went along on the honeymoon but didn't come back with them. This is only the second day that I haven't felt out-of-body due to cold medicines (believe me, that's better than bronchitis and pneumonia!). I'm just kicking back, doing a couple loads of laundry, and surfing through the net for inspiration. I started out by surfing Flickr for keywords like japanese, sewing and zakka (it means small handmade items). I found Kumi's set on handmade/tezukuri and from there surfed to the Moonstitches blog. Go see her page on sewing and fabrics - isn't that gorgeous eye candy? I'll end tonight's entry by showing you the emblemmatic picture of last week's trip to Kansas. 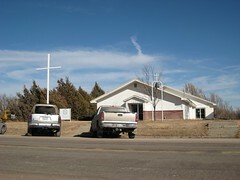 This is the Gove Bible Church, where Jim and Thelma Losey worshipped their Lord. See the bell in front, to the right? Mom commissioned that bell from the Fort Hays Kansas University Art Department, and had it forged to honor her brother. It has his name and the name of the church on it. They were very proud to have it mounted in time to ring for the funeral services. Me? I'm proud to have Jim as my uncle, and I'm proud of where I come from. I'm also proud to continue his tradition of "paying it forward," like in the movie. Harry, if you're out there, I am as you said, a boddhissatva. I started another project. 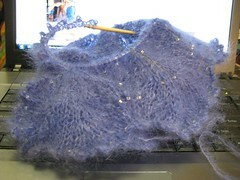 What can I say, I needed the distraction that a new project always provides. Obviously, I haven't gotten much done on it, but hey. It's PURPLE! wheee! 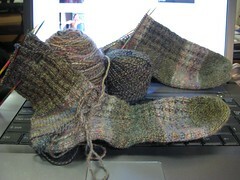 The shards socks are progressing slowly, but surely. 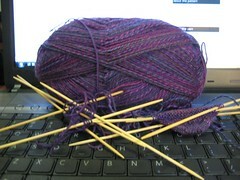 There was a mandatory "company-wide" meeting this morning that took 3 hours -- thank God I could knit. Lots of progress was made. Anyone interested? I'm thinking Saturday, March 8. I want to do the oxalis/indigo recipe posted on the NaturalDyes list, plus pomegranates and walnuts. I'm still a bit wiped out, but better today. I'm getting a bit knit on the Ice Queen, a bit spun on the Prudence fleece (RocketGansey-dottir), and I'm soaking some little peat pellets for dye plants. Pictures? Maybe soon, because I have lots of pictures to load from the last week. I wanted to tell a few stories about my Uncle Jim Losey. My Mom, Lutie Ann, says that their family pretty much fed anyone in town who was hungry. They owned the local gas station, and sold gas for 5 cents a gallon. Grandma would buy 500 baby chicks each spring, and raise them in the hen house. When they were pullet size, they'd kill, dress and cook about 5 per day. Can you imagine cooking for that many people? There were 7 kids, plus a lot of people who were "extended family." I already mentioned how small Jim was when he was born, and how they kept him warm on the oven door. Jim was a religious person, but not an evangelist. He would show his religion quietly, by being the behind-the-scenes angel who made things happen. During those old-fashioned box suppers, he'd notice whose boxes weren't being bid on, and buy them for about $3 each. This was back in the Depression, when that was big money. Then, he'd pass them out to the young men who couldn't afford to buy a box. Lawrence met Eleanor this way, and they're still married 60 years later. Eleanor is still one of my Mom's best friends. When my Grandpa died in a tragic house fire, Mom was 11 and Jim was fighting in WWI. He would rather have staid with his buddies and fight the war (according to my cousin Bob, anyway), but he came home to Gove to help his mom with the farm, and to help raise his 4 younger sisters. He also married his brother's widow -- Bill was electrocuted building his new home in Indiana, leaving Thelma with three small children. The Loseys in Gove piled in the car, and drove more than 24 hours straight through to Indiana. After the funeral, they brought Thelma and her 3 children back to Gove --to one of the worst winters ever. My cousin Bob said the snow was 12 feet deep, and the horses didn't even sink down into the drifts, but just went over the top. Thelma must have thought she'd moved to the ends of the earth. After about a year, Jim was ready to send the cattle to market. They would do this by loading cattle cars on the train, and the railroad would give one free ticket per cattle car filled. Well, according to my mom, this is how Jim proposed to Thelma. They were all around the dinner table, and Thelma asked if she could have one of the free tickets. Jim said "Well, I better marry you then!" My cousin Bob, who was one of those children Jim brought back to Gove and raised as his own, gave a superb eulogy. I wish I'd had the movie camera-- if you have a death of a patriarch like this, please do consider recording it for posterity!